For me, every good story about a native plant starts with the source of the plant, its provenance. Then the story follows. I can sit and read books on medicinal plants or books about edible native plants or ethnobotany and enjoy them as much as a good book of short stories, because those types of plant books give me the provenance and short stories as well. 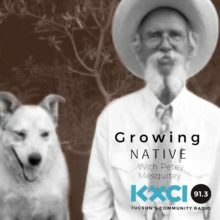 Sometimes too, I feel as if I’m learning another language as I read about the uses of native plants by indigenous people or any of the people that were in the southwest long before you and me. In the commercial plant business, I can guarantee you that the provenance of many plants is long lost and the seed or cuttings of plants are gathered in a median on Speedway Blvd in Tucson or in front of a Bank of America at some busy intersection. I suppose a good story could be found, but not the one I want. Native seeds and plants come with stories. Ask for them and share them. Some notes: The photos of Asclepias linaria were taken in the Galiuro Mountains. The photo of the milkweed in 1 gallon containers is poor, but it’s not a bad shot of Farley. And a big “HEY” to Micki, Merna, Tony, Roger, and of course John and Lynette up at Desert Trees Nursery northwest of Tucson. It’s like going home.